title "1.2.1 Verify CentOS GPG Key is Installed (Scored)"
desc "CentOS cryptographically signs updates with a GPG key to verify that they are valid." But first make sure that you go through last week’s tutorial so that we can make sure you have all of the proper software installed and updated. Nathen Harvey has a fantastic InSpec workshop that I’m going through right now, and he talks about it on Chef’s YouTube channel, too. Throughout my InSpec tutorial series, I’ll be showing you some basics for getting through his workshop successfully. Think of my tutorial as a remedial class before you take Harvey’s workshop, or some extra tutoring along the way. How about we just dive right in? Then just add this to the file, save, and exit. That’s it! Now we’re ready to roll. UPDATE: This is just a problem with CentOS. This is what our basic workflow for the workshop is going to look like. So head over to Nathen Harvey’s workshop, and note the very first one on the list because that’s what we’re after. Open the CIS CentOS Linux 6 Benchmarks v1.1.0 that you downloaded, then look for our command inside there. Once you’ve found it, we’re going to snag some of that information for our control. Look at the first three lines again. Notice that I chose the control to be the CIS number. I could have been more specific, obviously, but I didn’t for simplicity’s sake. Profile Applicability determines the impact field. And the title and desc come straight out of there word for word. Edited to add: Sometimes I use the “Rationale” section to enter into the desc instead when it describes it in a better way. Let’s open up our text editor and create a new file. I called mine 1_spec.rb. Then enter all of that in - the control, impact, title, and desc. They don’t tell you what the output is supposed to be, but we can guess that our audit passed because it didn’t say it failed. So now we know that apparently that’s the output that it gives when the test is run and it passes. Score! So let’s copy and paste that text somewhere to use in a sec. We don’t have to do that this time since we passed, so we’ll hold off on this step until another time when we need it. So there are a whole bunch of different audit resources to use for creating tests (and this InSpec reference page has all of them). An audit resource is basically the suggested tool to use in order to code your control. The two heavy hitting resources are going to be file and command. We used the file resource with the content matcher last week when we were searching for text within a file. So let’s take a look at the reference page and decide which to use now. In the menu on the right, you’ll see every possible resource. So what do we know about our test? When we run the audit command it gives us a standard output, right? 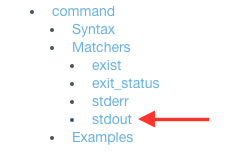 So let’s find command and - what do you know - it has a stdout option under Matchers. A matcher is just like it sounds - we want to match what’s in our test with what the stdout is. Alright, so when we click on stdout from the menu on the right, it shows us this test to use when we need to match a standard output. Let’s copy that and enter it into our text editor after the 4 lines we added earlier. Now let’s change the describe command to have the audit test from the CIS benchmarks. In the next step we’ll change the should match matcher, so hold off for now. Remember that standard output that we copied and pasted earlier in step 3? Grab that and head over to your browser that has Rubular opened. Now paste that standard output into Your test string. Now we’re going to pick out a shortened, regular expression out of that mess, enter it into Your regular expression, and if your Match result has it highlighted, then it’s happy and you’re safe to use just that shortened regex in your command. So copy that regex and get ready to paste it. For the command line newbs like me, test is the folder you’ve put your file in. username, ipaddress, and password are for your CentOS vm. Hopefully your test passed. If not…back to the drawing board for you. This is still a very nebulous process for me. I’m not quite sure how I’m ever going to know enough to be able to choose the right audit resources, and that gives me a little anxiety. I’m hoping that it dissipates the more I progress through Harvey’s workshop, though. It would be great if you tracked and shared your work in a git repository! Here’s mine. Anyone have any tricks of the trade for me?